Have you always wanted to try the harp? 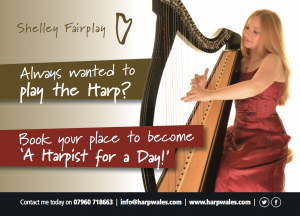 Come along to have a taster session on the National Instrument of Wales with Harpist Shelley Fairplay. During the workshop you will be introduced to a variety of different harps including Celtic, Concert Pedal and Lap harps. You will be allocated a Celtic harp to use throughout the session and be guided through your very first stages of learning the harp; how to sit, basic harp technique and of course how to create beautiful sounds! By the end of the session you will have learnt how to find all the notes on your harp, played an accompaniment along with Shelley and also be able to play a tune on your own! No guarantees, but we should also warn you that you may well totally fall for this incredible instrument and awaken your inner harpist! Celebrate your experience of having been ‘A Harpist for a day’! This harp experience is for people who have never played the harp before and no previous experience of music reading or performing is required. So come along and join us for a wonderful day of harp playing together. The harp is one of the world’s oldest and most diverse instruments appearing in Greek mythology through to Harry Potter. In Celtic tales harps often have magical powers of enchantment and this queen of instruments is deep rooted in our musical and cultural history. It is amazing that despite this, many of us have never played a harp or even been up close to one! In this class you will experience a short introduction to the harp using materials from Shelley’s new 36 week online learning course START HARP. During the workshop you will be introduced to a variety of different harps including Celtic, Concert Pedal and Lap harps. You will be allocated a Celtic harp to use throughout the session and be guided through your very first stages of learning the harp; how to sit, basic harp technique and of course how to create beautiful sounds! By the end of the session you will have learnt how to find all the notes on your harp, played an accompaniment along with Shelley and also be able to play a tune on your own! No guarantees, but we should also warn you that you may well totally fall for this incredible instrument and awaken your inner harpist! This workshop is aimed at complete beginners and all participants are given free access to week one of Shelley’s online START HARP course. Harp it up! is a six week group/whole class program designed to develop musical skills. The Harp, our National Instrument of Wales, is the central focus. Students will discover the instrument and develop their musicianship skills through playing the harp, listening to harp music and singing / moving to a harp accompaniment. Musical stories (HarpTales) from Wales and beyond will form a central focus to workshop content. The project uses eight beautiful medieval replica lap harps, each with 17 strings, for the student to learn on. I lead the workshops on a 34 string Celtic harp, the lap harps and for one session a ‘show and tell’ on a concert pedal harp. Boomwhackers and percussion are used as additional instruments for Hands on Harps sessions to assist with rhythm and note understanding for the whole class. There are ten clear targets for students to work towards on the harp (see below). At the end of the six weeks a show case of skills assimilated will take the form of performing a musical story as a group. Action and drama is augmented by music played on harps, songs learnt and a variety of other musical effects and sound. This final aim creates momentum with a clear goal to work towards and can be recorded for prosperity! Music covered in a session will encompass a variety of styles and genres including Celtic and Medieval tunes for class to play on the harp. Hands on harps of course includes well loved traditional welsh tunes. Harp Tales are interactive, exciting and educational musical stories told with harp accompaniment and child participation through song, sound and movement. Each HarpTale is carefully tailored to engage appropriately the age group being worked with. Music covered in a session will encompass a variety of styles and genres including well loved traditional welsh tunes. The session will begin with listening to the sound of the harp, a general introduction and interesting facts about the harp. This is followed by warm up activities to develop musical skills, all with a central focus on composing sounds and actions for the story. A song will also be learnt by the group. Then the Harp Tale will begin and children join in with sounds, movements and song. It may be possible for the child to have the opportunity to play the harp at the end of the story and finally the session will close with reflection and farewell! HarpTales can be booked as standalone session for Primary Schools, nurseries, library story time afternoons, public events etc. 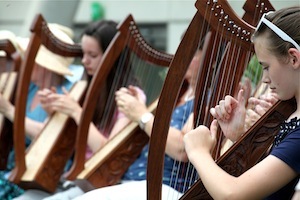 The HarpTales also form part of Hands on Harps – a six week group/class harp project. What Harp Tales can you expect? Three Billy Goats Gruff, Hare and Tortoise, Jack and the beanstalk, The Gruffalo, Owl Babies, Morgan and the Golden Harp, The Emerald Harp, Gabriel and the Bear, Treasure Hunt, Hairy Scary Castle, Harp O’Gold, And many more! Do make a request!